Pictured (from left to right): Jing Liu (SMC Geography Professor), Christyanne Melendez (SMC Geology Professor), Ciaran Brewster (SMC Anthropology Professor), William Selby (retired SMC Geography Professor), and Joan Hackeling (SMC Geography Professor). What do sustainability, our connection to nature, and LA have in common? As it turns out…a lot! 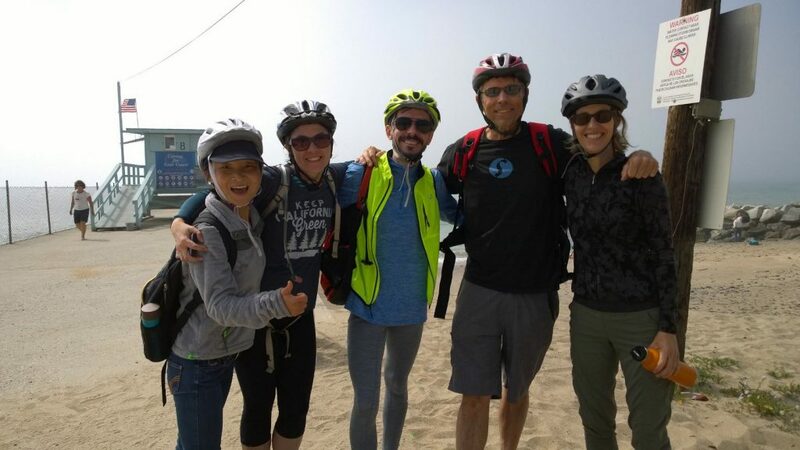 William Selby, a retired geography professor from the SMC Earth Science department, led a group consisting of current SMC Earth Science faculty and members of the greater Santa Monica community on a natural history tour of the Santa Monica Bay. The focus of the tour was sustainability in the context of a geologically active urban metropolis that is both blessed and burdened by the complex interactions between the lithosphere, atmosphere, and human biosphere. As Bill Selby describes it, our attempts to control what was (and still is) a geologically active environment with unique meteorological patterns has led to some missteps. But all hope is not lost! Bill Selby also shows us that by nurturing our inherent connection to our natural environment through intellectual, emotional, and physical pursuits we can learn to see ourselves as a part of the natural landscape, rather than separate from it. This mindset can help us better see and utilize the ways that we can work with our natural conditions, rather than against them, creating a more sustainable future for this megalopolis.